Overall, 64% of Latino adults ages 18 and older used the internet in 2008, compared with 54% of Latinos in 2006.5 Given this rapid increase in internet use, Latinos are now as likely as blacks to go online (63% of blacks used the internet in 2008). 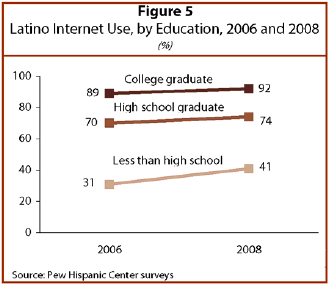 However, Latinos remain significantly less likely to go online than whites, 76% of whom used the internet in 2008. As is the case across race and ethnic groups, younger Latinos were more likely to be online than their older counterparts. Some 77% of Latinos ages 18 to 34 went online at least occasionally in 2008. Among those ages 35 to 49, 65% went online. Just over half (53%) of those ages 50 to 64 used the internet, and among those ages 65 and older one-in-four Hispanics used the internet. Latinos who were born in the United States were much more likely than those born outside the U.S. to use the internet — 77% of native-born versus 52% of foreign-born Latinos went online at least occasionally in 2008. Statistical tests show that a gap in internet use between native-born and foreign-born Latinos persists even after accounting for differences in educational attainment, household income, and English proficiency. 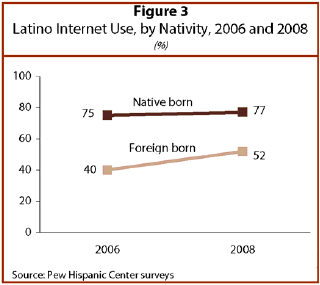 The difference was even larger in 2006 when only 40% of foreign-born Latinos were online, compared with 75% of the native born. 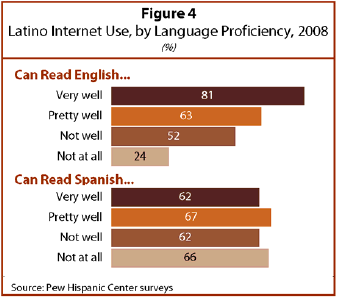 Lack of English-reading ability appears to be a significant barrier to internet use for Hispanics. The vast majority of those who could read English very well (81%) used the internet in 2008. Among those who could read English pretty well, 63% used the internet. Roughly half (52%) of those who said they couldn’t read English well went online, as did only 24% of those who couldn’t read English at all. The link between English proficiency and internet use does not diminish if other related factors—educational attainment, household income, and nativity—are held constant. 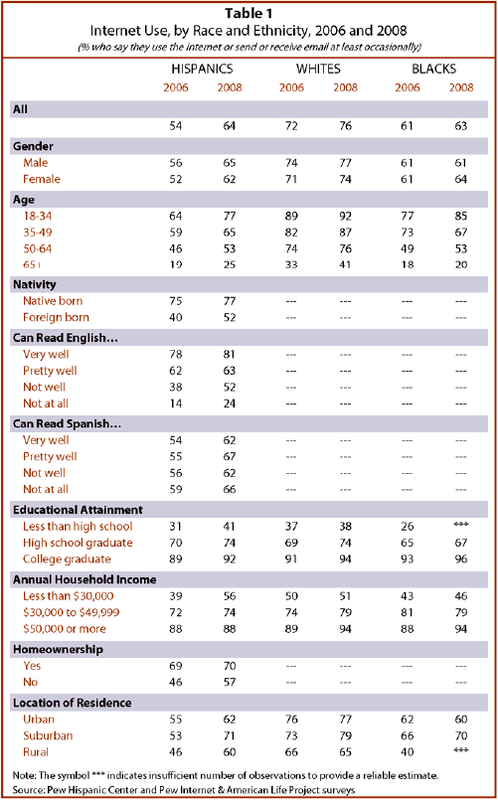 Conversely, the likelihood of being online does not differ significantly for Latinos based upon their Spanish-reading ability—62% of those who read Spanish very well were online in 2008, compared with 67% who read it pretty well, 62% who didn’t read it well, and 66% who couldn’t read speak Spanish at all. The fact that English reading ability, but not Spanish reading ability, was associated with internet use suggests that it is not literacy per se that is affecting internet use for Latinos, but instead it is English literacy. Education and income were strongly linked to internet use. The overwhelming majority of Latinos (92%) who graduated from college used the internet in 2008, and roughly three-quarters (74%) of Latinos who graduated from high school used the internet. By contrast, only 41% of Latinos who had not graduated from high school went online at least occasionally in 2008. 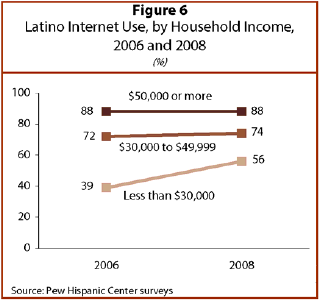 Among Latinos with annual household incomes of $50,000 or higher, 88% went online at least occasionally in 2008. Those with lower household incomes were less likely to go online. Roughly three-quarters (74%) of those living in households with annual incomes between $30,000 and $49,999 a year used the internet, and even fewer (56%) of those with household incomes of less than $30,000 a year went online. Since 2006, Latino internet use rose more rapidly among those with less education and lower income, while it leveled off for other groups. In 2006, 31% of those who never graduated from high school used the internet, but the share increased to 41% in 2008. At the same time, for high school graduates, there was a four percentage point increase in internet use, and for college graduates, there was a three percentage point increase. Internet use among middle- and higher-income Latinos remained relatively stable in recent years, while the percentage of low-income Latinos going online increased significantly. In 2006, only 39% of those with household incomes less than $30,000 used the internet, and that share rose to 56% in 2008. Conversely, there was only a two percentage point increase in internet use for those with household incomes of $30,000 to $49,999 annually, and there was no rise in internet use for people in higher-income households.